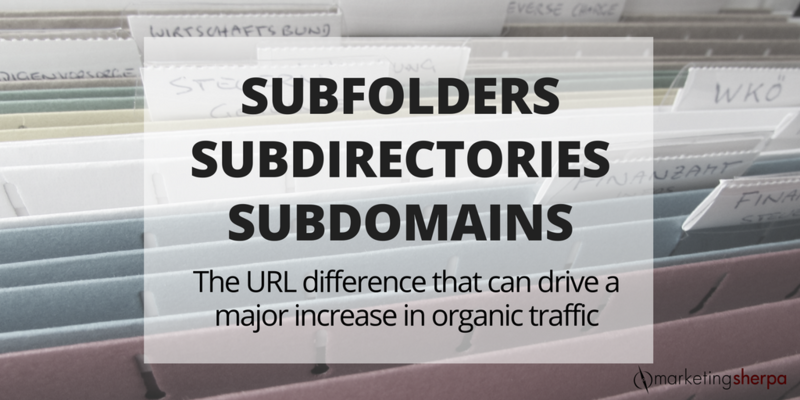 We were recently asked if it’s better to use a subdirectory (also known as a subfolder) or a subdomain on a website. If you’re unfamiliar with these two terms, you’ll know them right away when you see URL examples. A subdirectory looks like this: marketingsherpa.com/freestuff. A subdomain looks like this: sherpablog.marketingsherpa.com. Even www.marketingsherpa.com/ is technically a subdomain. The difference may seem like an esoteric or gorpy concern that only developers and programmers care about. After all, why should the URL matter anyway? Most people are just clicking on links. And occasionally when they actually have to type one in (say, from a newspaper ad), you’re creating a vanity link that redirects to the actual URL anyway. Well, search engines may care. A lot. Even if they claim they don’t. And the experts I asked said that subdirectories are almost always the better option. “From a ranking authority perspective, a subdirectory is just a page on a website that inherits all the existing brand and domain equity from the root domain. A subdomain, on the other hand, would be starting from scratch … apart from some vague affinity to the core domain,” Eli Schwartz, Director of SEO & Organic Product, SurveyMonkey, told me. Schwartz provided Medium as an example. Every blog post is a subdirectory and can benefit from Medium’s ranking ability. On the other hand, if you create a new blog on WordPress, your blog would have its own subdomain and not benefit from WordPress’s domain history. “Content that’s placed in a subfolder will almost always perform better in Google (and Bing and DuckDuckGo) than the same content placed in a subdomain,” said Rand Fishkin, Founder, SparkToro (and former Wizard of Moz). While Google is officially agnostic on subdomains versus subdirectories, Google talks about SEO like the Federal Reserve provides testimony on interest rates — lots of implying, very little direct promises or specifics. “It’s damn hard to argue that there’s ‘no difference,’” Rand said. Beyond SEO, there are other benefits to subdirectories as well. For one, subdirectories don’t require cross-domain tracking and can be easier to track in analytics. Much like search engines, many analytics platforms treat each subdomain like a unique site. That doesn’t make tracking across subdomains impossible, but it does make it more complex to set up. You usually have to do more than the standard analytics install which, if you’re using subdirectories, can be as easy as pasting a tracking code snippet into your website’s code. Another benefit of subfolders is usability for your visitors. “They make for cleaner web URLs that are easier for most people to visually parse — and processing fluency is correlated with more sharing, more clicking, more of all the things website owners want,” Rand said. At MarketingSherpa, we like to take a balanced approach to issues. So while subdirectories/subfolders are probably the best approach for most of our readers, I still had to ask if there are any instances where using a subdomain is the best approach. When it’s very technically challenging (or near impossible) to use a subfolder; e.g., when you install third-party tech on your site to host content, a subdomain is often vastly easier. That’s why Hubspot and others like them do it this way. Subscribe to the MarketingSherpa newsletter — Don’t leave it to the search engines to luck into content like this from MarketingSherpa. Subscribe to our newsletter to get helpful information sent straight to your inbox.